When Apple Music launched in 2015, the service received mixed reviews. One of the biggest gripes was the impact it had on the Music app. Instead of it being a place for your music library, the app began catering to the streaming service. Cesium offers a better music library experience. The simple, brilliant app brings back the classic Music app (aka the “iPod” app), making it easy to view and enjoy your personal song library. Cesium is an alternative music app for accessing and listening to your music library on iOS. Built to look and feel like the classic iPod app, it gives you a fantastically old-school way to listen to your music on your devices. Cesium is simple and intuitive. Its best feature is its ease of use. Launching the app brings you straight to your songs, artists, albums or playlists. And playing music is fast and simple. Cesium’s swipe actions are another great feature. By swiping right on a song, you can view metadata about the album, and the musical genre, as well as the track’s play count and the date it was last played. Swiping right on artists, albums or playlists in your music library allows you to quickly play or shuffle the selection. Cesium is like the old iPod app, with modern features and an easy-to-use interface. Left swipes on any media in Cesium give you access to queuing features. This allows you to quickly set a song to play next, or add it to the end of the playback queue. The queueing features make listening through the app more convenient. Cesium also makes it very easy to view music downloaded to your device. 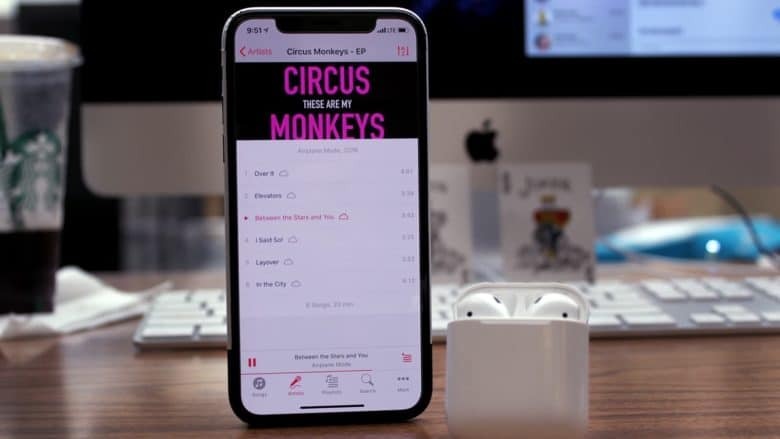 Tapping the cloud icon in the app will show only portions of your music library saved on your device, which also makes it great for listening while you’re traveling or away from a reliable data connection. Cesium is great for anyone that has music in iTunes, but isn’t on Apple Music. It’s also great for anyone that wants to listen to their music library without a data connection. If you loved the old iPod app, and are sick of the Apple Music features in the music app, you need Cesium. It’s the best music app replacement for iOS, and a better way to enjoy your music library.